Welcome to part 2 of discussing moisture in an existing concrete floor surface. It's always important to note that Concare has held the designated certification by ICRI for Concrete Slab Moisture testing. Remember to take caution with those that 'say' they are certified, trained or approved. It's always safe to ask to see the certificate to ensure the experience is present. If moisture is present under vinyl tile, seamless tile, or rubber tile, you will see little air pockets, that look like bubbles if the concrete is coated, you might also see elongated strands that appear lighter in color than the rest of the floor. If you also notice the floor covering is slightly raised, or the 'bubble' has a little crack with something oozing out the side of it, it's another sign that moisture may be present in the concrete. If you have carpet or vinyl tiles and you notice they are loose to the point where you can detach the tile from the concrete...check underneath. If you can see and/or feel the dampness underneath, moisture is present. Another sign for carpet tiles is a gummy appearance of the carpet tile adhesive. Contact me to have a complimentary evaluation on your concrete floor at 708-681-8800 or email me at ron.puszynski@concare.com. In this two part article, we're going to discuss moisture in an existing bare concrete floor surface. Concare is certified by ICRI for Concrete Slab Moisture Testing. Take caution with those that 'say' they are certified, trained or approved, ask to see their certificate. Efflorescence is a white powdery substance that is deposited on the surface of concrete floors and walls due to moisture permeating through the surface. It is actually a type of salt that is in the concrete. When moisture is present in the concrete, it moves to the surface, the water dries up and leaves the white powdery substance. 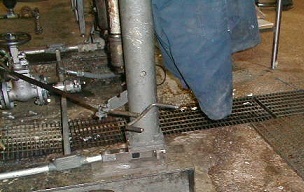 Rubber mats are frequently used for standing on or wiping your feet. If the mat has been there for at least 48 hours, lift up the mat to look underneath. If there is a dark color, it's indicative of moisture or dampness which also means moisture is present...it could also have a white discoloration. Contact Concare if you suspect a moisture problem in your concrete floor. Call us at 866.CONCARE or direct IL: 708.681.8800 WI: 920.746.0300. A Concare customer asked us to evaluate their freezer floor and come up with a solution for the uneven wear after years of use. The original freezer floor was built with trap rock. Trap rock is a very hard mineral that can be incorporated into wet concrete and troweled into the floor surface. The purpose of the customer using trap rock was to ensure a longer-lasting floor with high compressed strength and very dense. The customer’s busy freezer has large aisles, enough for 2 forklifts to pass. When an order picker drives down the aisle, it utilizes the same path each day, numerous times per day. Approximately 2 feet of space is untouched between the rack and the forklift. This space is utilized by the order picker to retrieve the box, remove the plastic wrap from around the box, open it up and pick out the number of items needed to fulfill the order. Here’s where the problem comes in. The slightly used floor between the forklift and the rack gets ice particles, or crystals dropping onto the floor. 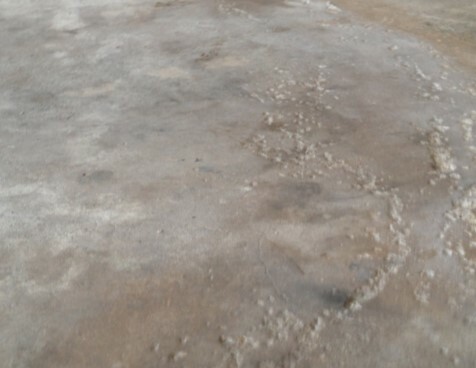 The moisture thaws and then re-freezes causing the surface of the floor to become slippery creating a hazard. Right where the picker needs to work. The entire floor did not need to be recoated, the concrete was performing well. Installing a textured coating in the 2 feet of space is also a short-term solution as the texture will wear off in time. Concare came up with a solution to texturize the floor, a more permanent solution without creating a bigger cleaning issue. Concare can provide the right solution with our Quality Assurance process. To get a copy of the Quality Assurance Program, email me at ron.puszynski@concare.com. I’ll get a copy out to you right away. 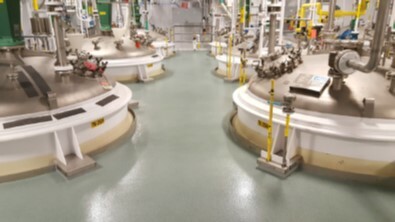 About 90% of companies needing their concrete floor coated or protected run into the challenge of how to get the project done. Th shut down production for any length of time is impossible. How can a high performance concrete floor coating be installed? Here's how. 1. Concare works with you, the customer, to help prioritize the project by identifying sections that needed improvement. 2. Each section is evaluated as it may require a different floor protection solution. 3. Each section is carefully planned down to the small details including timing to clean, prep and install. 4. timelines are set in accordance with the production schedule. Once the 4 steps are complete, the timeframe is identified and work begins. Completing a site survey on an industrial floor can be very revealing. It can reveal its history, how it's been cared for and what it needs to continue performing. Concare can evaluate the condition of your concrete using several different criteria. The site survey will help to determine the industrial flooring solution your facility needs to operate at peak performance. Let us know if you'd like to receive a complimentary site evaluation. ron.puszynski@concare.com. Why is Being ISN Certified Important? 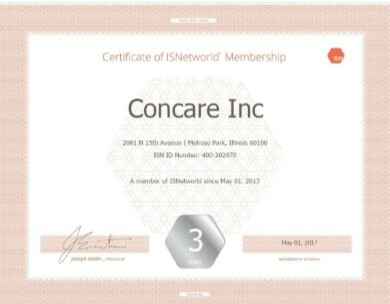 Concare is an active member of ISNetworld. We centralized our compliance data within ISNetworld and streamlined our reporting process making members of ISN easier to prequalify Concare. ISNetworld is designed to meet internal and governmental record keeping and compliance requirements by collecting health, safety, procurement, quality and regulatory information. Because Concare is ISN Certified, hiring clients who are members of ISN, can view information ensuring we meet their criteria. Once contacted, we begin the process by evaluating the concrete floor in order to recommend the best floor coating solution. Being ISN Certified gives the member the confidence in making the right decision in choosing Concare. If you would like to have your concrete floors evaluated by an ISN certified partner for repairs, antimicrobial coating, ESD or sloping to name a few, contact me at 708-681-8800. What are the Signs of Moisture in Concrete? Flooring failures can occasionally be attributed to moisture in the concrete. If you are not sure if moisture is affecting your floor, here are a few signs that can be indicators. •	Efflorescence. Efflorescence is a white powdery substance that appears on the surface of the floor or walls. the moisture makes its way up through the concrete and when it dries on the surface, it leaves a salt-like deposit behind. It can appear around crack or joints in the floor as they are a perfect exit point for moisture. •	Rubber Mat. A rubber mat, used at a workstation or an entryway, can be an indicator for moisture. If the rubber mat has been in that spot for more than 48 hours, lift it up and check if there is a dark discoloration left behind. If it's the same color as the bare concrete next to it, moisture may not be at elevated levels. If it's darker than the concrete around it, higher moisture may be present. Signs of moisture under vinyl and coated concrete floors. •	Bubbles, Air Pockets. Moisture can appear as bubbles, air pockets or even elongated strands 4 to 12 inches in length. These areas will appear lighter, or it may be cracked with a liquid discharge. •	If the carpet tiles are loose, pick one up. If there's dampness underneath or if you notice that the adhesive is sticky, these are clear indications of moisture. Hire a concrete floor coating expert like Concare who's ICRI Concrete Slab Moisture Testing Certified. Contact us at 866.CONCARE or 866.266.2273. Visit Concare at www.Concare.com. When Does a Protective Wall Coating Make Sense? 1. Sanitation is crucial. You've protected your floor with an anti-microbial coating (if not, contact Concare) however, splashing occurs during wash downs causing abrasive chemicals and detergents to land on the walls. 2. Moisture is a concern. Outside humidity comes to the inside. Protection generates heat increasing the humidity. Washing the floor and equipment adds more moisture. 3. Hitting the walls. Forklifts, falling objects, carts and gurneys are some of the more popular objects that frequently hit the walls at various impacts. Contact Concare today to have your walls and concrete floors evaluated for maximum protection. Ask for me personally at 708-681-8800 in IL (covers IL, IN, IA) or 920-746-0330 in WI (covers WI, MI). To begin, the USDA does NOT approve products, installation or methods of installation. The USDA utilizes field representatives that observe facility conditions and ask about products used at the particular location. After careful observation, the USDA inspector reports on the condition of the concrete floor. Concare follows the USDA standards to ensure a compliant floor. 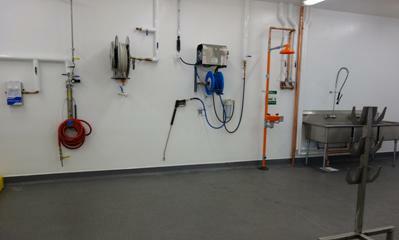 We also use materials that conform to an inspector’s expectation for sanitation. Some manufacturer’s even go through the rigorous process of sending their product for inspection and approval through NSF International. Our job is to support your efforts for a successful audit by the USDA. That’s why Concare takes on the added responsibility of being HACCP Trained, PCQI HARPC Trained, and Concrete Coating Inspector Certified. Being able to apply our training and experience is what we do to ensure a successful installation and audit for your concrete floors. Your industrial concrete floor needs repair. However, you are not sure if it’s just repairs or if the entire floor needs to be done. You search the Internet for concrete coating companies, and choices are plentiful. However, how do you know if you’ve reached the right contractor for your project? •	Was the call answered by a live person? •	Did they ask you any questions beyond your name and number? Next, this is surprising, but we hear it all the time. •	Was your call returned? Not just returned right away, or the next day…I’m talking…ever. •	Did they ask you for further information? •	Did they ask about your business? Square feet? Issues you are experiencing? Budget? Timing? Gathering this type of information helps to identify the right salesperson for the site visit. If you would like to experience the Concare Way: lowest life cycle cost, done right and on-time, call Concare and ask for me personally at 708-681-8800 in IL (covers IL, IN, IA) or 920-746-0330 in WI (covers WI, MI). What’s the Difference Between Concrete Painting & Concrete Coating? Existing concrete floors often need a surface treatment for either visual appeal or to protect the concrete from damage. In order to determine the right solution, let’s first define the difference as they each have their own performance characteristics. Concrete painting is typically used to make a concrete surface look clean and fresh. The process consists of cleaning, then painting the surface. Minimal preparation, but minimal performance, too. 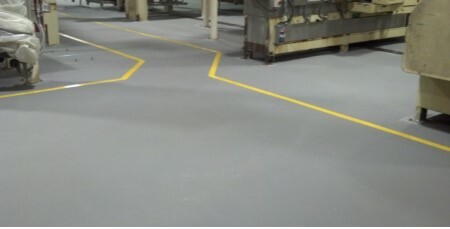 Concrete coatings are high-performance flooring solutions formulated based on the environmental conditions of the facility or business. The purpose of a concrete coating is to protect the surface and hold up to abuse such as chemicals, hot water, forklifts, steel wheels and other factors. Preparation depends on the existing floor surface. There are various preparation methods and each deliver a different result. Depending on the concrete floor’s current condition, a professional concrete coating installer, such as Concare, may recommend grinding, milling, scarifying, shaving / grooving or shot blasting. The preparation method is critical for the concrete coating to adhere to the concrete. If you’re not sure which solution is best for you, give me a call or at one of our two locations: 708-681-8800 in IL (covers IL, IN, IA) or 920-746-0330 in WI (covers WI, MI) and we’ll visit your facility to conduct a thorough analysis of your concrete floor. Preparing the space in your warehouse facility, distribution center or manufacturing plant for concrete floor repairs takes organization and time. Concare has put together a list of 5 steps to help make the process go quickly and smoothly. Quick note on repair materials. All repairs are completed with high quality, resilient materials in order to accommodate any contraction or expansion. Cracks can move, meaning the concrete on one of the sides, shifts or moves. A high quality, flexible material will work to stop the crack in the concrete floor from progressing. For further details on our repair methods, let me know and I'll send you our checklist and brochure. Contact Concare today if you need to repair cracks, joints, chips, or potholes in your facility. Ask for me personally at 708-681-8800 in IL (covers IL, IN, IA) or 920-746-0330 in WI (covers WI, MI).